An interesting figure historically among early rock vocalists, not so much for her decent, if sporadic, output during her formative years but rather because she got her widest acclaim years later in jazz under a different name altogether. 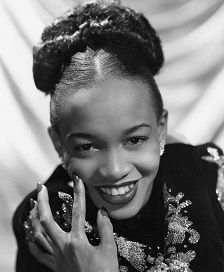 Born in 1930 in Newport News, Virginia, Shaw won an amateur contest at The Apollo Theater in Harlem when still in her mid-teens and she was hired in late 1948 by saxophonist Paul Williams as a vocalist for his band, a common practice for instrumental recording stars in order to provide a more diverse stage show than merely playing the sax all night. She’d cut a lone side two years earlier for jazzman Buddy Tate but it was with Williams where she headed into rock ‘n’ roll by singing lead on the follow-up to his biggest hit from earlier that year. The record became a minor hit, charting nationally for a single week in July. Despite this when the band returned to the studio that fall she got no further opportunities to sing and was soon on the move cutting records for a string of small labels, showcasing her powerful earthy tone, occasionally imitative of fellow Newport News native Ruth Brown who was the most popular female rock singer of the era. Shaw’s vocal skills were evident from the start but with less well-funded companies and rarely having first rate material she was unable to break through commercially, remaining primarily a club singer who would resurface every so often to cut more records in the dominant style of the day. She sang with such artists as Billy Ford in the early 1950’s and King Curtis’s group mid-decade and began writing her own songs in time, but over the course of the 1950’s she gradually mellowed her style from the racy brashness she exhibited early on, first heading into more of a pop-rock vein and then by the early 1960’s she made a wholesale switch to jazz with her first album Sings For Swingers. While those transitions usually don’t pan out, creatively or commercially, Shaw proved to be the exception. Over the course of her long and winding career she handled each style, no matter how disparate in execution, with conviction, authentically delivering songs ranging from her gritty rock origins to sophisticated light jazz with equal skill, changing her tone on command to handle whatever the material called for. By 1965 she’d moved to England for a fresh start professionally and to that end she changed her name to Salena Jones, combining the names of Sarah Vaughan and Lena Horne, two of her inspirations, while altering her own first name to become a more common last name. From that point forward her career took off as she established herself as one of the more admired and consistently popular female jazz vocalists of the second half of the Twentieth Century. She remained based in Great Britain, having a television show there at one point, but became known for touring worldwide to great acclaim. Her rock origins long since expunged from her repertoire, Shaw was still going strong, recording albums and headlining concerts well into the 21st Century. Though never a star during her decade in rock and possessing just one minor hit in the field, Joan Shaw ultimately proved herself to be among the more versatile and talented vocalists to emerge from rock ‘n’ roll.